Golobal 5000 load cell detail using our large cell format with extra deep cups. Small cell kits can be very dangerous as the jack point can spit out due to the small cup. Note the amount of jack point that fits inside our cell top. Our large format cells will fit on top of your standard Tronair Jacks. We use the standard one inch hole mounting as shown, we can also supply over the top adapters as well as 2.5 inch mounting studs for larger jacks like Columbus, Malabar or Regent. Our large format cells meet the manufactures maintenance manual requirements for weighing as shown. Our cells insure that the load path is followed and the aircraft weight is determined properly. Click the link below for our M2000-3-50CSLC quote page. 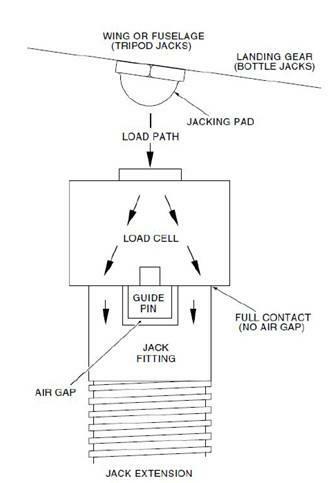 Global on top of jack load cells. Our large format cells work great for the Golbal Jet, M2000-3-50CSLC kits are available and can weigh most large corporate, regional and airline jets. Easy use, accurate readings, meets the maintenance manual requirements for loading and application for weighing.